A chic choice for cruises or cocktail parties, this short wrap dress is a trendy option for the girl with an edge. The easy-to-wear party dress has a surplice v-neckline and short tulip-skirt hem that are both provided by the wrap detail that ties at the side. For sun-kissed shoulders on tropical vacations, the thin spaghetti straps complete the sultry look of this easy-to-pack cruise dress. 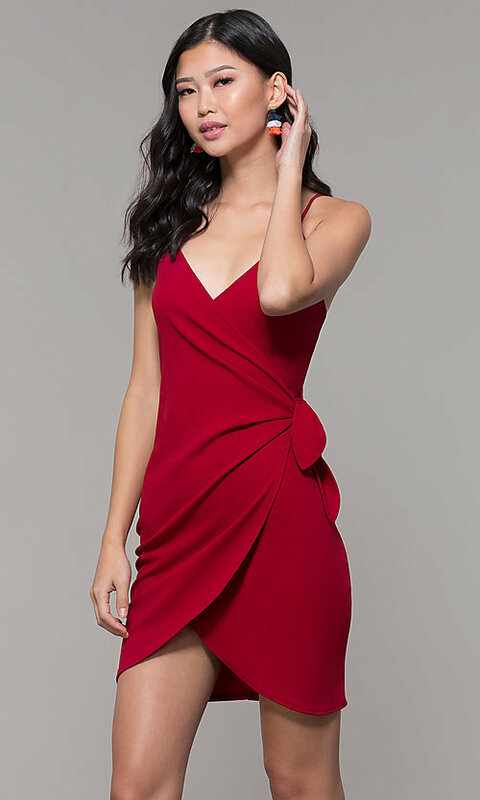 The short wrap party dress, under $50, is ideal for the budget-minded girl that likes to be comfortable while maintaining a sophisticated style. The model wearing red is 5'8.5".